This page is for all orders for U.S. and is 100-120v electricity. Alabama, Alaska, Arizona, Arkansas, California, Colorado, Connecticut, Delaware, Florida, Georgia, Guam, Hawaii, Idaho, Illinois, Indiana, Iowa, Kansas, Kentucky, Louisiana, Maine, Maryland, Massachusetts, Michigan, Minnesota, Mississippi, Missouri, Montana, Nebraska, Nevada, New Hampshire, New Jersey, New Mexico, New York, North Carolina, North Dakota, Ohio, Oklahoma, Oregon, Pennsylvania, Rhode Island, South Carolina, South Dakota, Tennessee, Texas, U.S. Virgin Islands, Utah, Vermont, Virginia, Washington, Washington D.C., West Virginia, Wisconsin, Wyoming. Orders for Hawaii must pay sales tax. Spring Sale: It is time for our Spring Sale! Now until April 27th, 2019, big discounts on the following items: Biomat Aroma Stand, Pro size Biomat Black Canvas Travel case, Queen size Cotton Pad, Pro size Biomat Waterproof Cover, Rejuvena Premium, Alkalife 3000sl Water Filter. Buy One Alpha Max Serum 3.5 or Mega Bio Cleanse and Get One Free. Must order from Spring Sale page for the special pricing. We also ship worldwide. International Orders. Order securely online or call our Sales Department toll free at 1-877-Bio-Mat-Order (1-877-246-6286). Your orders are 128bit encrypted for secure and safe transactions with your credit card in our shopping cart, or you can pay by check or money order, see our FAQs for details. Our preferred method of payment is Paypal, we accept Visa, MasterCard, American Express or Discover. You don't need a Paypal account to use Paypal and you can use a credit card with Paypal. If you have problems ordering with a credit card and the cart shows only Paypal, please give me a call toll free at 1-877-Bio-Mat-Order (1-877-246-6286). Need financing? You can with Paypal. You can now order 220/240v for US shipping further down this page. 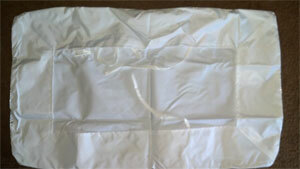 Every bio-mat order includes the Bio-mat, 100% cotton padded cover to protect the bio-mat, controller, carry case. For information on our returns and repair policy, see our FAQs for details. Each Amethyst Bio-mat has an Amethyst layer for transferring natural infrared waves, TOCA (Tourmaline) layer for natural negative ions, carbon fiber and copper fabric layers for Electromagnetic interception, peach and grapeseed fiber layer for heat preservation, and 12 other layers. The Amethyst Bio-mat comes with an advanced IC chip and soft-touch control system, which has many convenient functions. 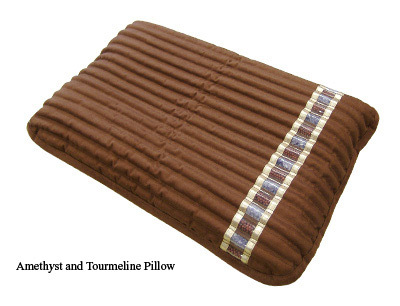 Includes the Bio-Mat Amethyst and Tourmaline Pillow which features a therapeutic shape to provide additional support for your neck while comfortably cradling your head. The Professional Bio-Mat is also available without the pillow. This is the massage-table size Bio-Mat (27.56"w x 72.83"h) for all-purpose functionality and ease of mobility. Great tool for massage therapists and chiropractors, it comes with a hard shell travel case with wheels and handle for ease to carry the Bio-mat, and 100% cotton padded cover. This is an U.S F.D.A. Approved Class II Medical Device. The complete set! This package comes with a massage-table size Bio-Mat 7000mx (27.56"w x 72.83"h) for all-purpose functionality and ease of mobility. Great tool for massage therapists and chiropractors, it comes with a hard shell travel case with wheels and solid bar handle for ease to carry the Bio mat, and 100% cotton padded cover. This is an U.S F.D.A. Approved Class II Medical Device. And includes the Bio-Mat Amethyst and Tourmaline Pillow which features a therapeutic shape to provide additional support for your neck while comfortably cradling your head. Also includes the Bio-Mat Quantum Energy Pad composed of environmentally friendly raw materials such as organic compound energy extracted from peach and grape seeds, which is beneficial to the human body's biological vibration. 6 Layer Structure: Microfiber Fabric Cover, Microfiber Layer, Quantum Energy Layer, Liquid Tourmaline Layer, 3D Mesh Layer (20mm), 3D Mesh Cover (3mm). Measures 19.69"w x 33.46"h. The Bio-mat Mini contains Amethyst and Tourmaline. This is the perfect take-along for trips, to keep at the office or to share with a friend or family member who would benefit from using this therapeutic device and is great to use in easy chairs, Med-Spa, dental & office chairs. Many customers purchase the Mini in addition to the Professional size, and use the Mini on top of them while laying on the Professional. It is also the perfect size for children. Many of our customers have also purchased the Mini-Mat for their beloved pet. The Amethyst Bio-Mat Mini ships with a single dial control panel, hard shell travel case and 100% cotton quilted cover. Bio-Mat Quantum Energy Pad composed of environmentally friendly raw materials such as organic compound energy extracted from peach and grape seeds, which is beneficial to the human body's biological vibration. 6 Layer Structure: Microfiber Fabric Cover, Microfiber Layer, Quantum Energy Layer, Liquid Tourmaline Layer, 3D Mesh Layer (20mm), 3D Mesh Cover (3mm). Measurements: King: 21.2 lbs / 78.74" x 70.86" x 1.57"; Queen: 17.5 lbs / 78.74" x 59.06" x 1.57"; Single: 11 lbs / 78.74" x 39.37" x 1.57": Professional: 10 lbs / 72.83" x 27.56" x 1.57". Professional 73" x 28" x 3"
Single 79" x 39" x 3"
Our Elastic Polyurethane memory foam pillow features a therapeutic shape to provide important neck stabilization to ensure an anatomically supportive sleep posture. Channels of Amethyst and Tourmaline crystals in the 100% cotton zip cover which can be removed and used as a body wrap for chest, stomach, arms, and legs to assist in relief of many ailments. A specially designed cover utilizing organic compounds from peach and grape seeds, amethyst and tourmaline. Use the comforter with your biomat to enhance the power of negative Ions and Far Infrared rays. We designed the comforter to be light and comfortable allowing you to relax and have a good night's sleep. Comes with 2 pillow slip covers. 20.01" x 23.62" x 20.47"
"The first week I slept on my Bio Mat, I was waking up after 3-4 hours because I was getting hot. I had the setting at the 2nd green light and 2 blankets, but I wasn't using the pillow. So I took the case off the Amethyst and Tourmaline Pillow and put it under my pillow on top of the Bio Mat, and ever since then I have been getting 6-8 hours of restful and quality sleep each night. The Amethyst and Tourmaline Pillow is a must. I won't sleep without it." Fill out our ISA (Independent Sales Agreement), and receive Distributor Kit which contains everything you need to start selling the Bio-Mat including several brocures, order forms, and information material. 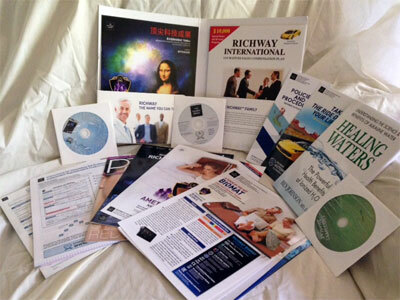 Also gives you 1 Business Center (if you have not ordered a Bio-Mat). Protection circuits: 8-A fuse, constant current control circuit, anti-overheating device. If you need to order a new filter please contact the distributor you ordered from, or call Richway at 855-338-6410 toll free or email customerservice@richwayusa.com. One available. Has not been used, filter is new, missing box. 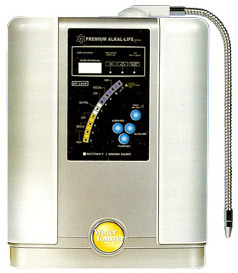 Comes with pH tester and all accessories for easy hookup to your faucet. One available. Had only 1 filter used, includes new filter. Unit is used, but in excellent condition. 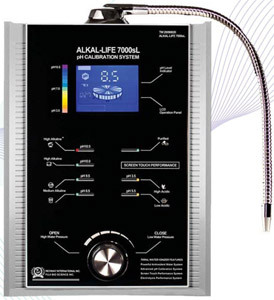 Comes with pH tester and all accessories for easy hookup to your faucet. Only the unit and adapter were used, tester and other accessories were not used. 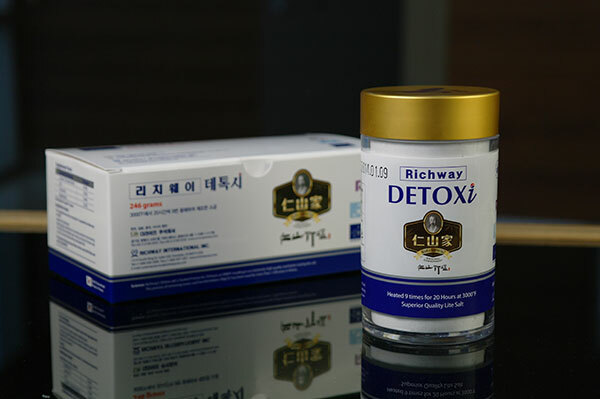 Richway has partnered with Cellreon, makers of the finest Korean luxury skincare and beauty products. An intensive serum to combat dry skin, wrinkles, elasticity, loss of volume, and reduce the appearance of age spots and uneven skin tone due to aging. Key Ingredients: Passionfruit Meristem Cell Extract - A potent antioxident with collagen supporting qualities; Sericin (silk protein) - deeply hydrates and moisturizes the skin; Growth Factors and Peptides (GFP) Complex - 8 different peptides and 6 growth factors to support natural fibroblast function. Contains 12 7ml ampoules in each box. Mega Bio Cleanse 365 is your daily source of dietary fiber. Made with our proprietary blend of fibers and nutrients. Maintain your digestive health – all in a convenient package. Mega Bio Cleanse 365 can only be shipped within the United States. Richway & Fuji Bio Inc. Detoxi 300Hrs Powder is produced from sun-dried salt that is packed inside the hollow sections of bamboo. It is then burnt 9 times at 3000 f. The high kiln temperatures ensure elimination of both, heavy metals and toxins. This process creates a very pure grade of Bamboo Salt that contains lots of essential minerals and micronutrients. It has a high content of Phosphorus, Zinc and ionized hydrogen. Additionally, it has an exceedingly High Oxidation Reduction Potential, making it beneficial for all. Richway & Fuji Bio Inc. Detoxi 300Hrs is a pure high quality nutrient that is very alkaline, helping balance the cellular osmosis pressure, and is not detrimental like common salt. Richway & Fuji Bio Inc. Detoxi 300Hrs is very safe. Take 1 packet with 8 oz. water before using the biomat. This package comes with a massage-table size Bio-Mat 7000 (27.56"w x 72.83"h) for all-purpose functionality and ease of mobility. Great tool for massage therapists and chiropractors, it comes with a travel case with shoulder strap for ease to carry the Bio mat, and 100% cotton padded cover. This is an U.S F.D.A. Approved Class II Medical Device. And includes the Bio-Mat Amethyst and Tourmaline Pillow which features a therapeutic shape to provide additional support for your neck while comfortably cradling your head. The Professional Bio-Mat is also available without the pillow. This is the massage-table size Bio Mat (27.56"w x 72.83"h) for all-purpose functionality and ease of mobility. Great tool for massage therapists and chiropractors, it comes with a case with shoulder strap for ease to carry the Bio-mat, and 100% cotton padded cover. This is an U.S F.D.A. Approved Class II Medical Device. Measures 19.69"w x 33.46"h. This is the perfect take-along for trips, to keep at the office or to share with a friend or family member who would benefit from using this therapeutic device and is great to use in easy chairs, Med-Spa, dental & office chairs. It is also the perfect size for children. Many of our customers have also purchased the Mini-Mat for their beloved pet. The Amethyst BioMat Mini ships with a single dial control panel, travel bag and 100% cotton quilted cover. We also ship worldwide. For other countries: International Orders. US orders on this page, we ship to California, Florida, New York, Washington, Texas, Alabama, Vermont, Connecticut, Oregon, Georgia, Arizona, Minnesota, Missouri, and all states.